PT Games is very excited to become a reseller of Tabletop Football by ABC Games. We have had a long association with TTF and ABC Games going back over 15 years and finally, we have brought the two together. As we are a reseller you will go to the ABC game company website to purchase and access all of your downloads. By purchasing from us you will receive a discount of 20%. Use the code ‘ptgames’ to receive the discount. We are also hosting a TTF forum, the only public area to ask PT Games or ABC Game about the game and especially to offer comment on your gameplay. Tabletop Football by ABC Games is a modernizing of Statis Pro Football. Pro and College Versions Available! Statis-Pro player ratings, updates, and game innovations! Tabletop Football is a faithful continuation of the classic Statis-Pro Football game. 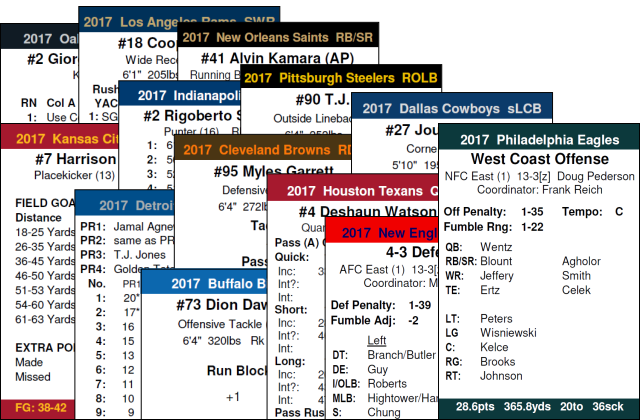 Individual player cards for all players on all teams can be used with any Statis-Pro edition, or you can take advantage of additional player ratings and game updates using the extended Tabletop Football Rules of Play and College Rules Supplement. New plays and formations, updated penalty, timing, and kickoff tables, and other rule changes. Basic, Advanced, and Solitaire game options. Download updates and bonus gaming material, including previous professional and college seasons. How is Tabletop Football different than Statis-Pro Football? The basic TTF Rules of Play are based on the last official Statis-Pro Football rules, and the game is played the same way. In fact, Statis-Pro player cards can be used with Tabletop Football, and new TTF player cards can be used with original Statis-Pro Football rules. TTF provides important game updates, including revised penalty, timing, kickoff, try, and overtime rules. In addition, new Tabletop Action Cards (TAC) and advanced rules of play add exciting formation rules, plays, and strategies, which allow coaches to implement modern offensive and defensive schemes. The TAC and advanced rules are designed to take advantage of numerous new player ratings without changing the way the game is played. The Tabletop Football Game Rules of Play can be viewed here. What new player ratings are provided on TTF player cards? TTF player cards include all the original Statis-Pro ratings and add more precise position information, season stats, seperate rushing and receiving rest rates, exceptional tackling and blocking, QB scrambling, passing under pressure, clutch and shotgun ratings, inside and outside running, pass deflections, penalty range, DB tackling and pass rush, receiving route adjustments, pass protection, extended long gains, fair catch frequency, individual kickoff cards, fumble range, sack fumble range, forced fumbles, expanded long returns, interception return, expanded FG range, punting inside the 20-yard line, kick and punt return defense, offense tempo, and team penalty and fumble ratings for offense and defense. Players are rated in a variety of categories depending on the position(s) they played during the season. Ratings are applied consistently for all players at each position, and are derived from player statistics, performance data, and overall team success. Additional adjustments are made for fringe players who had limited playing time. Can I use original Statis-Pro player cards with Tabletop Football? Yes. The basic or advanced TTF Rules of Play can be used with all Statis-Pro player cards. TTF adds some game updates, including formation options and new play and strategy selections. Some TTF game enhancements are only available with the updated Tabletop Action Cards (TAC) or player cards that include the latest player ratings. Can the game be played without the advanced rules? Yes. The TTF Rules of Play are based on the original Statis-Pro Football rules. The advanced rules are optional and include additional game enhancements and additions, including new player ratings. I am familiar with Statis-Pro Football. Can I play without the latest TTF rules to play the game? Yes, you can sit down and start playing immediately. However, a number of TTF player ratings are not available in the older Statis-Pro rules. The basic TTF Rules of Play are based on the last official Statis-Pro Football rules, with a number of modern game updates. The TTF advanced rules of play provide additional game elements, including the use of the new player ratings. Can I still use my own Statis-Pro game variants? Yes. One of the endearing elements of Statis-Pro Football is the ability to create and use your own game variants. This is retained in Tabletop Football. In most cases, game variants developed for Statis-Pro Football will work with Tabletop Football. Currently, previous NFL seasons from 2012 to 2016, and college teams from 2013 and 2015, are available. These previous seasons may be purchased separately. Are printed cards and game components available? Yes. 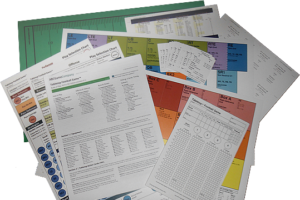 All game components and player cards can be ordered in printed format. Print orders include access to all product files in electronic (PDF) format. Electronic files are formatted for standard letter, legal, and ledger paper sizes, with clear cutting guides when necessary. Online updates are provided free of charge. How is the college version different than the professional version? The college version of the Tabletop Football Game includes all of the professional game components and is played the same way. An additional rules supplement prescribes the necessary additions and modifications for the college game, including different penalty, fumble, timing, and overtime rules. Team Power Ratings are applied to account for strength of schedule and other program differences. The Tabletop Football Game College Supplement can be viewed here. Does the college version have individual player cards? Yes. Individual player cards are provided for every player at every position – exactly the same as the professional version. What college teams are available? Starter team packs and selected College Football Playoff teams are available for 2017, 2015, and 2014, and more than 60 FBS college teams for the 2013 season are immediately available. The Tabletop Football Game, All-American version starter packs consist of FBS Independents, service academies, and selected teams. Other teams may be available in conference packs, including Big Ten, Mid-American, PAC-12, and Southeastern conference teams. Additional teams are occassionally released. Can I order individual teams? Yes. Individual printed teams from existing NFL or Conference Packs can be requested on the order page. To submit your request, provide the team(s) your interested in and complete the order normally. A quote will be generated and sent to you. Can I request additional college teams? Yes. Additional teams can be requested on the order page. To submit your request, provide the team(s) your interested in and complete the order normally. A quote will be generated and sent to you. Are discounts available for multi-player leagues? Yes. Multi-player discounts and licensing are available for existing or new Statis-Pro Football leagues. Please contact us for additional information.